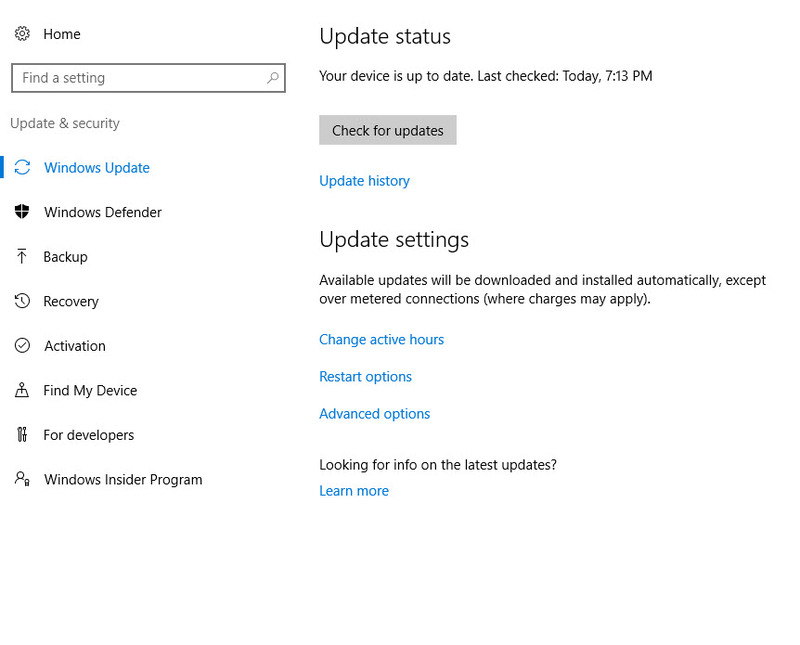 If you are already managing your Windows 10 systems (currently 1607 and below) with System Center Configuration Manager, then chances are you might want to prevent certain users from also being able to “Check online for updates from Microsoft Update.” before you have had a chance to fully test the latest cumulative update or feature update. 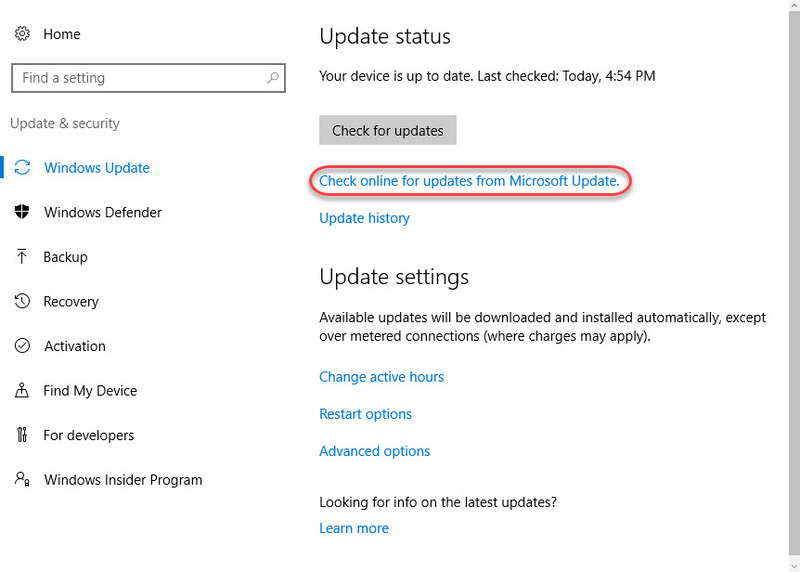 Unfortunately, when users go into Settings > Update & security they will see a Check for updates button and below that, a Check online for updates from Microsoft Update link. Hopefully we will see an option in the future that will allow for the ability to disable this link without disabling the ability to install apps from the Windows Store. There is another setting in which will disable the ability to communicate with Windows Update, but will continue to allow the Store to work. Yep – you are right Rich. Thanks for that tip as well! Good information, thanks. Does this also disable the ability to install a driver from Microsoft when an unknown device is plugged into the PC? Hi Don, I haven’t tested it but I imagine it would block it as well. Thanks! Do you think this setting will be separated from Store in future? We set “Turn Off Access To All Windows Update Features” but this does not remove the link “Check online for updates from Microsoft Update”. One more setting we miss in Windows 10. Good to know – I know it disappears with the other setting. I will provide feedback to Microsoft on it. None that I know of – maybe we will see something with the Windows 10 Creator’s Update. This does not seem to work for me with Win10 1607 LTSB. 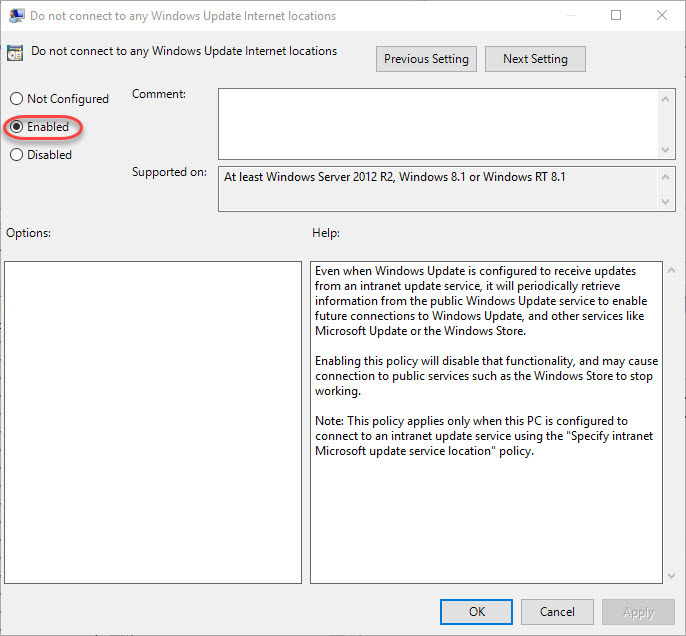 I have Specify intranet Microsoft update service location enabled for SCCM, but when I also enable Do not connect to any Windows Update internet Locations, the Check online for updates from Microsoft Update link remains. Even after a GPUpdate force and or reboot. Have you come across any other methods for removing this link from 1607? Disregard my previous comment. This does in fact seem to be working. Thanks for the post! No, and I mention that in bold in the blog: “If you enable this setting, you will not only disable the ability to check online for updates from Microsoft Update, but you will also disable the ability to install software from the Windows Store.” It is a catch-22 until the later version of Windows 10. -. The user can’t check online for Microsoft updates. -. Drivers must be installed if new hardware is pluged in. Anyone suggestions to achieve this ? 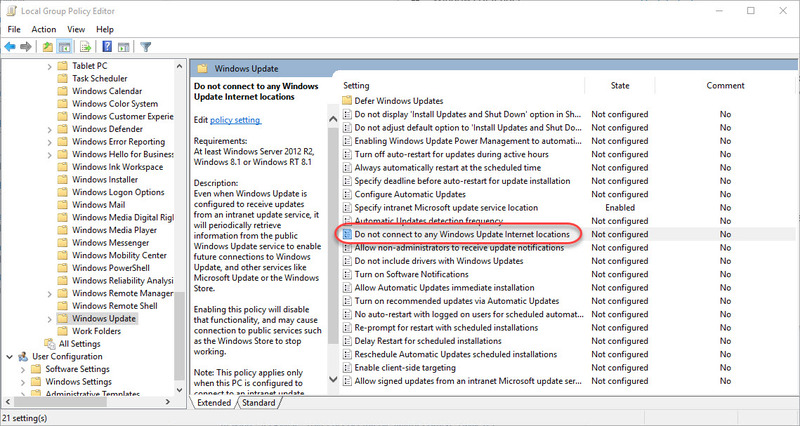 By enabling the Group Policy setting under Computer Configuration\Administrative Templates\Windows Components\Windows update\Remove access to use all Windows update features, administrators can disable the “Check for updates” option for users. Any background update scans, downloads and installations will continue to work as configured. I have not tested it yet, but it sounds like it should work and achieve what you are trying to do. Tom, Could you confirm that “Turn Off Access To All Windows Update Features” in conjunction with MMPC as your default source of Defender/SCEP signature definitions, allowed you to continue to receive AV signature updates? Were there any other side effects of this configuration to consider? Thanks.